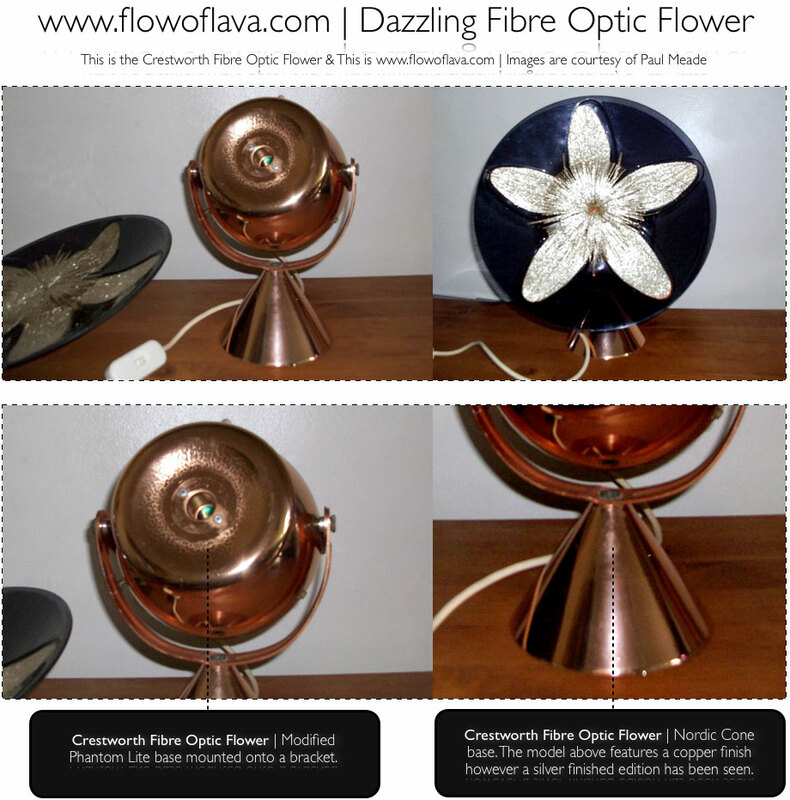 Crestworth Fibre Optics and other products | Fibre Optic Range. 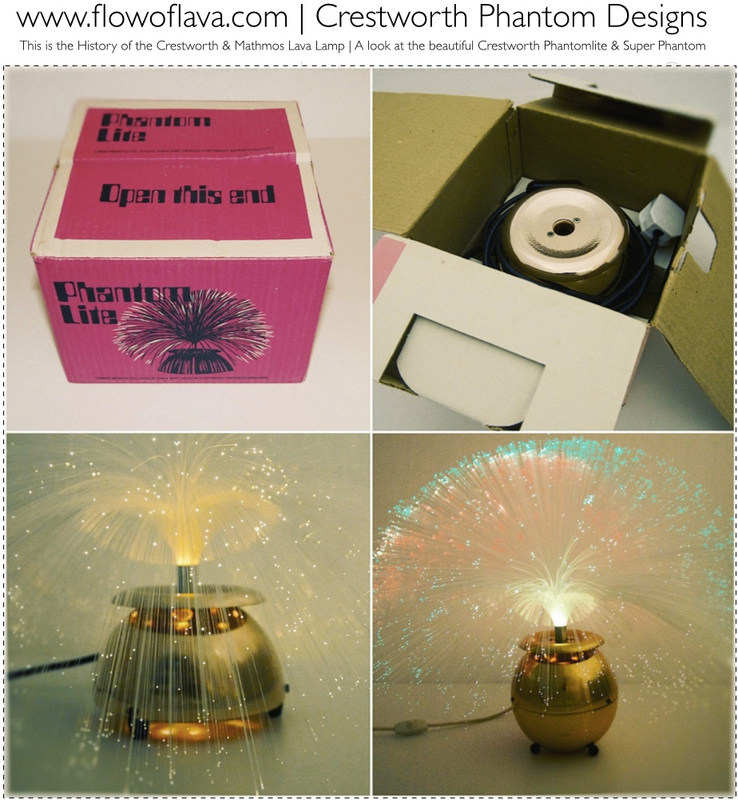 In the 1970s, Crestworth also expanded and created a line of fibre optic lamps, there are many designs and they all have the Crestworth charm and design flare. 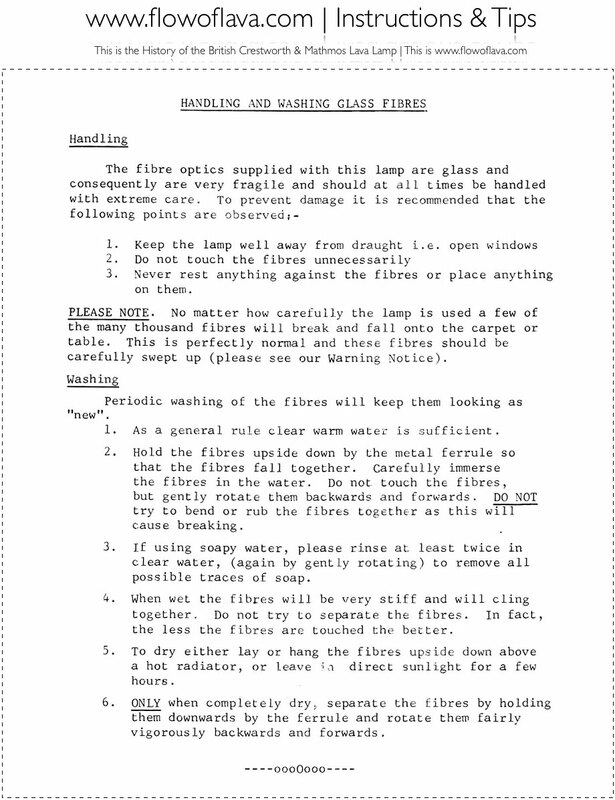 1970s Fibre Optic Range Included. : Galaxy, Phantom Lite, Super Phantom, Supplementary Base, Snowflake, Crystalite, Flowerlite. These models are featured on the website. 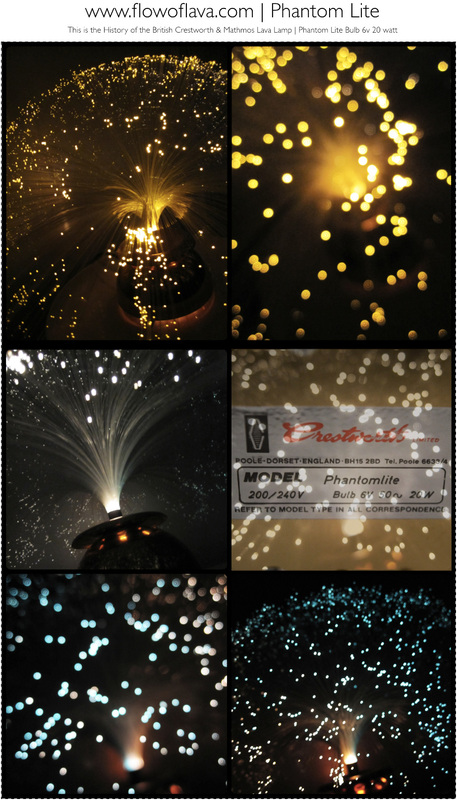 Fibre Optics - Phantomlite, Super Phantom (Supplementary Base). Phantomlite: A new excitingly elegant addition to modern decor with its delicately arranged fountain-like spray and twinkling fairy-light effect enhanced by gradual, subtle colour changes. In the case of the Phantomlite the fibre optics are thicker and made of plastic so there is no need for a protective "sealed unit" as in the case of the myriad-fibre Galaxy. 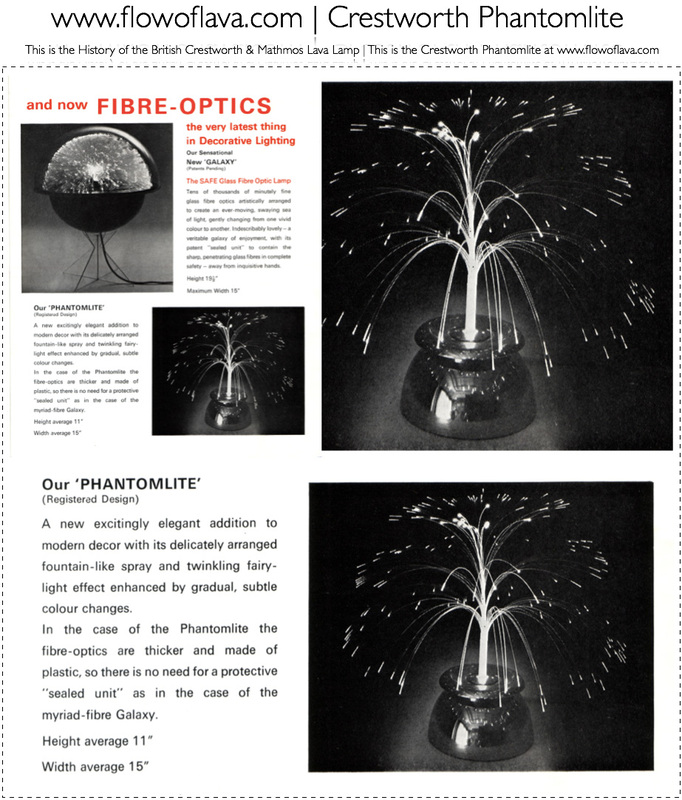 Later versions of the Phantomlite shipped with glass fibre optics as other manufacturers started to ship glass fibre optics. Two versions of the glass fiber optics were also options: small and large. "SUPER PHANTOM": Owing to public demand we have now introduced into our range of Fibre-Optics this superlative version of our Phantomlite. Incorporating our already immensely successful base design this new lamp, with its myriad of minutely fine fibres creating an ever changing sea of colour must surely rate as the most sensational lamp yet to be introduced for use in the modern home. Supplementary Base Two Lamps in one ! By using the special supplementary base the normal "Phantomlite" domed base can be changed to a sphere (or back again in a matter of seconds, thus catering for all tastes and changes of mood. 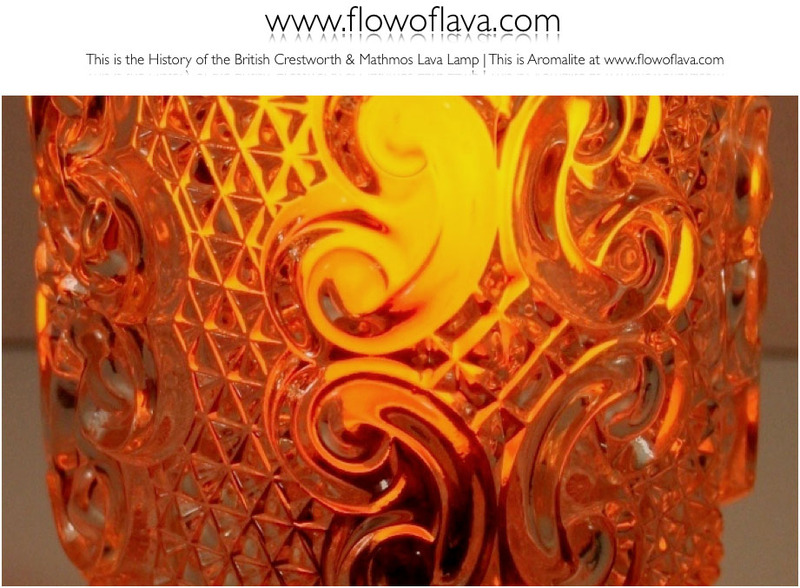 Whilst Crestworth was world-renowned for its signature invention, the Astro lamp, the world's very first lava lamp. 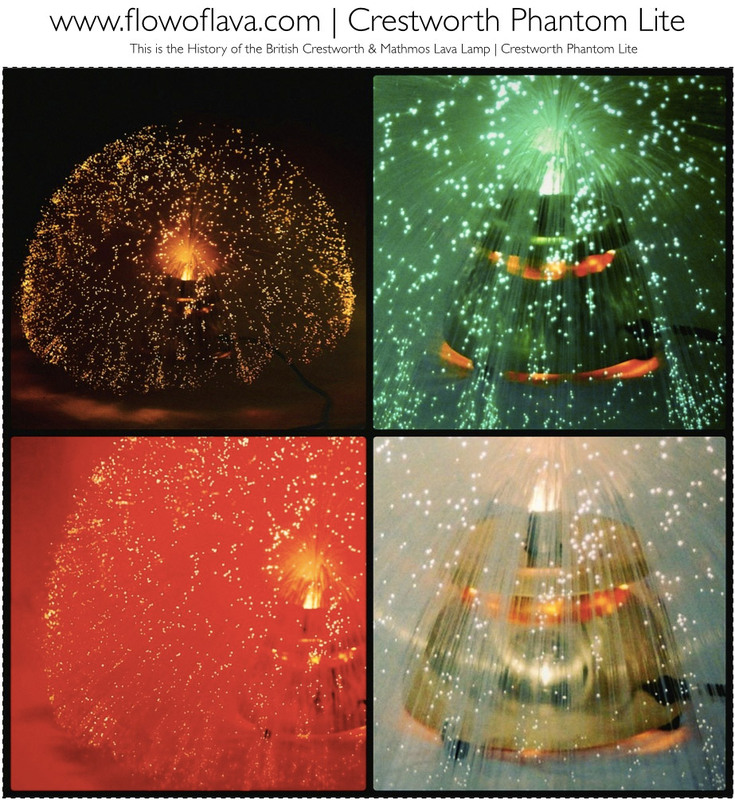 It also led the way to create some of the most beautiful fibre optic lights, such as Phantomlite (Which could be turned into the Super Phantom via the supplementary base), Snowflake with automatic rotating, Crystalite with a unique ornate glass base and the very traditional Flowerlite. 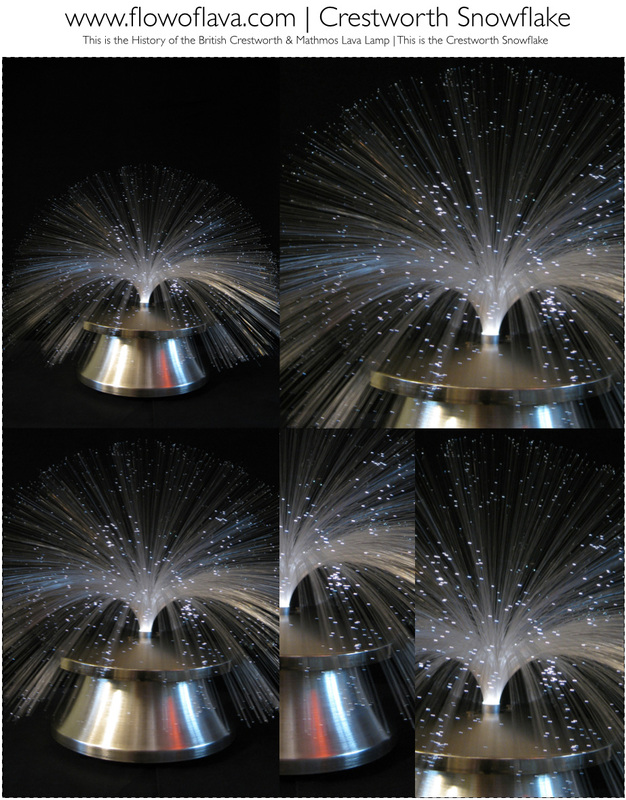 Enjoy the galleries below which show a detailed look at each of these amazing fibre optic designs by Crestworth. With special thanks to Callum Carr, Nick Carr and Jeb Paterson for the images below. Crestworth Phantom Lite | Introduced by Crestworth in 1973. One of the most commonly found Crestworth fibre optics aside from the Galaxy, is the Crestworth Phantom Lite. It originally shipped in a pink box with a small diagram of the lamp on the top with the words Phantom Lite written at the top. The base is made features a copper finish and the fibre optics slot into the hole at the top. The Crestworth Phantom lite is a wonderful product with automatic colour changing. 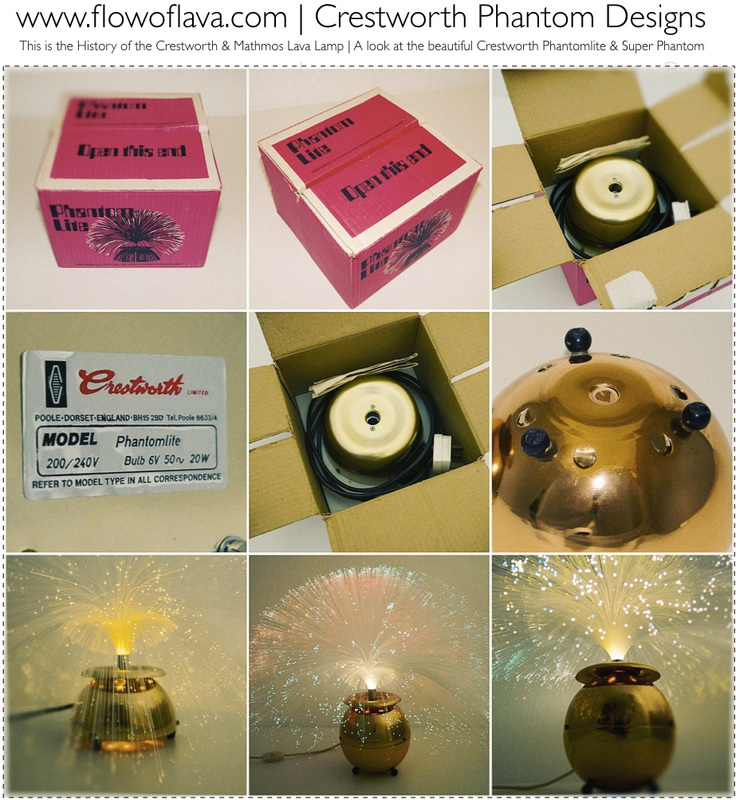 To create the Super Phantom, Crestworth created a special base for the Phantom Lite, which turned the base into a sphere. With thanks to Lincolnshire Metal Detectors for images below. Below: Crestworth Phantom Lite & Super Phantom. Photographed by Nick & Callum Carr. 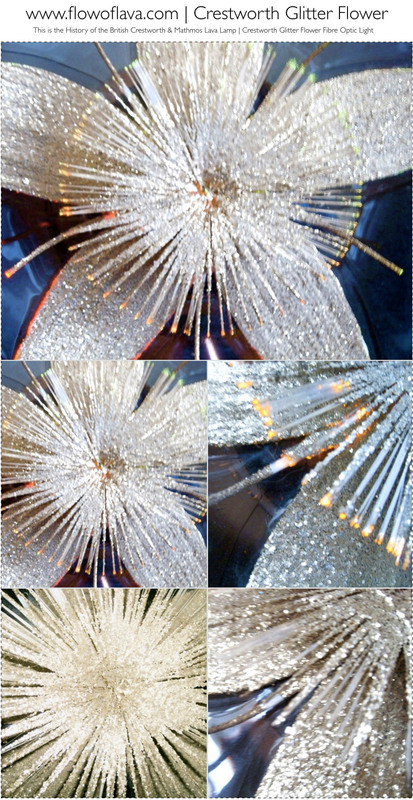 Crestworth Revolving Snowflake Fibre Optic Design. A product that is very often forgotten is the Snowflake by Crestworth, a very subtle yet unique design, this model below features a revolving set of fibres with stunning colours. This is an amazing piece, that I truly admire. Snowflake features automatic colour changing and also spray rotating, which means the fibre optics rotate. Images below are the kind courtesy of Pieter Willems, Nick & Callum Carr. 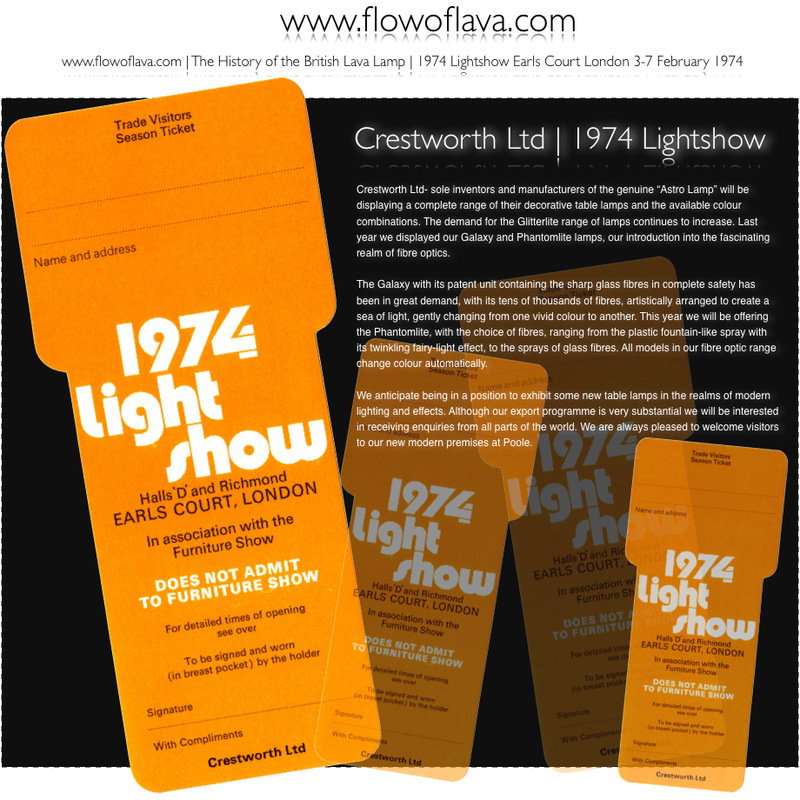 www.flowoflava.com | 1974 Lightshow Earls Court London. 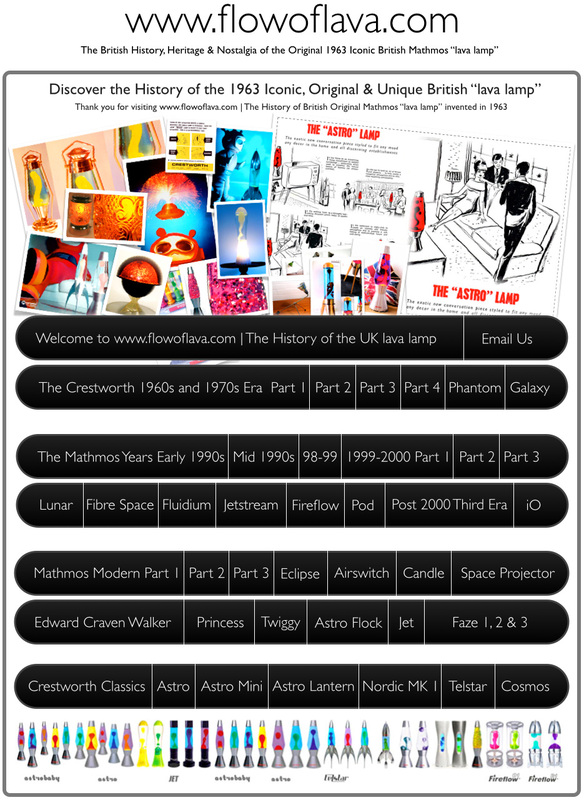 Crestworth Ltd- sole inventors and manufacturers of the genuine “Astro Lamp” will be displaying a complete range of their decorative table lamps and the available colour combinations. The demand for the Glitterlite range of lamps continues to increase. 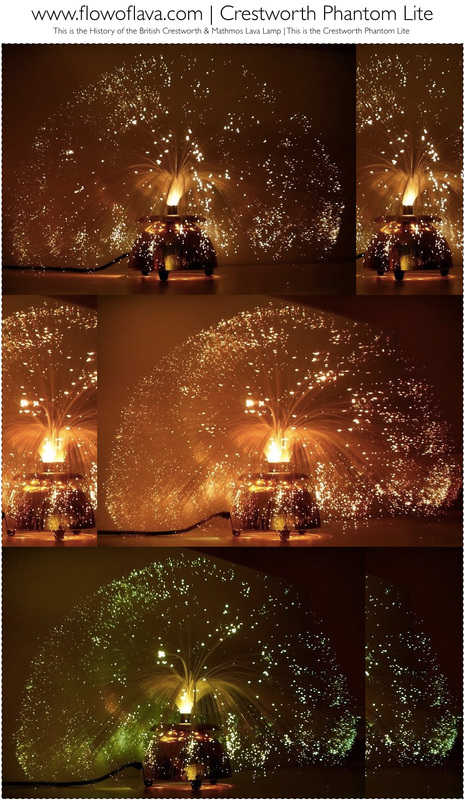 Last year we displayed our Galaxy and Phantomlite lamps, our introduction into the fascinating realm of fibre optics. The Galaxy with its patent unit containing the sharp glass fibres in complete safety has been in great demand, with its tens of thousands of fibres, artistically arranged to create a sea of light, gently changing from one vivid colour to another. This year we will be offering the Phantomlite, with the choice of fibres, ranging from the plastic fountain-like spray with its twinkling fairy-light effect, to the sprays of glass fibres. All models in our fibre optic range change colour automatically. We anticipate being in a position to exhibit some new table lamps in the realms of modern lighting and effects. Although our export programme is very substantial we will be interested in receiving enquiries from all parts of the world. We are always pleased to welcome visitors to our new modern premises at Poole. Crestworth Crystalite | 1975 Vintage Excellence at the Brighton Lighting Exhibition. 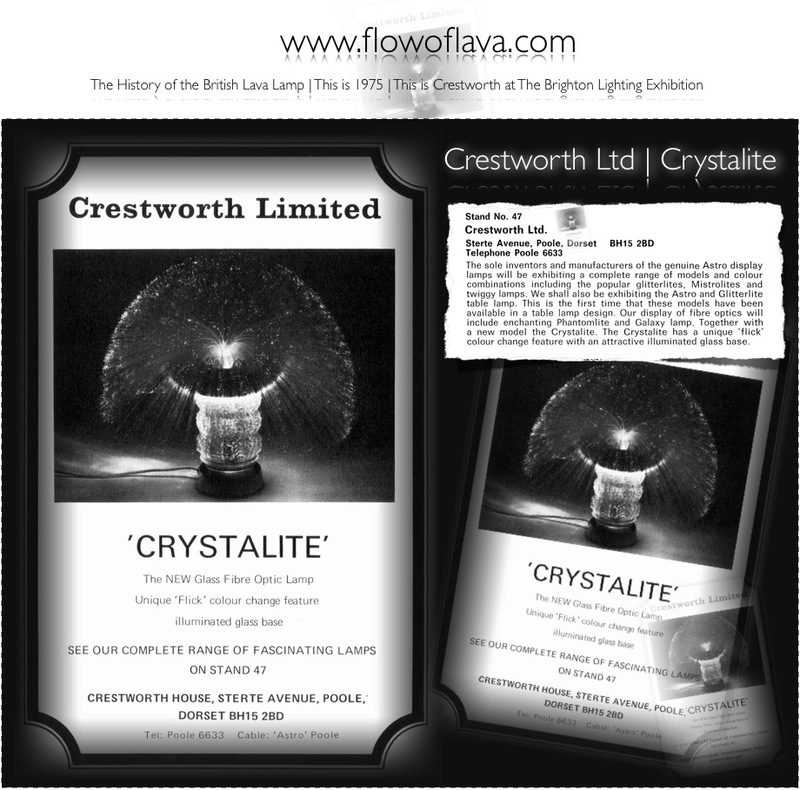 I would like to thank George Tilley from English-thorn-proof clothing for images of the Crestworth Crystalite, as displayed below. 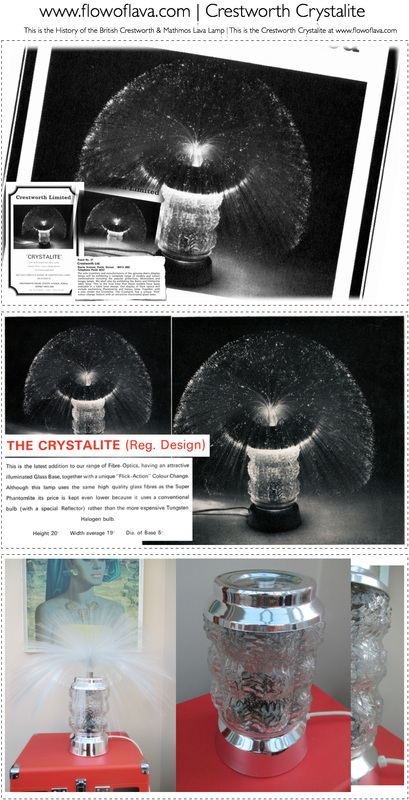 www.flowoflava.com | The Crystalite Fibre Optic Lamp | Introduced by Crestworth in 1973 | Images by: Nick & Callum Carr. The Crystalite by Crestworth - This is the latest addition to our range of fibre-optics, having an attractive illuminated glass base, together with a unique "flick-action" colour change. Although this lamp uses the same high quality glass fibres as the Super Phantomlite, its price is kept even lower because it uses a conventional bulb (with a special reflector) rather than the most expensive tungsten halogen bulb. 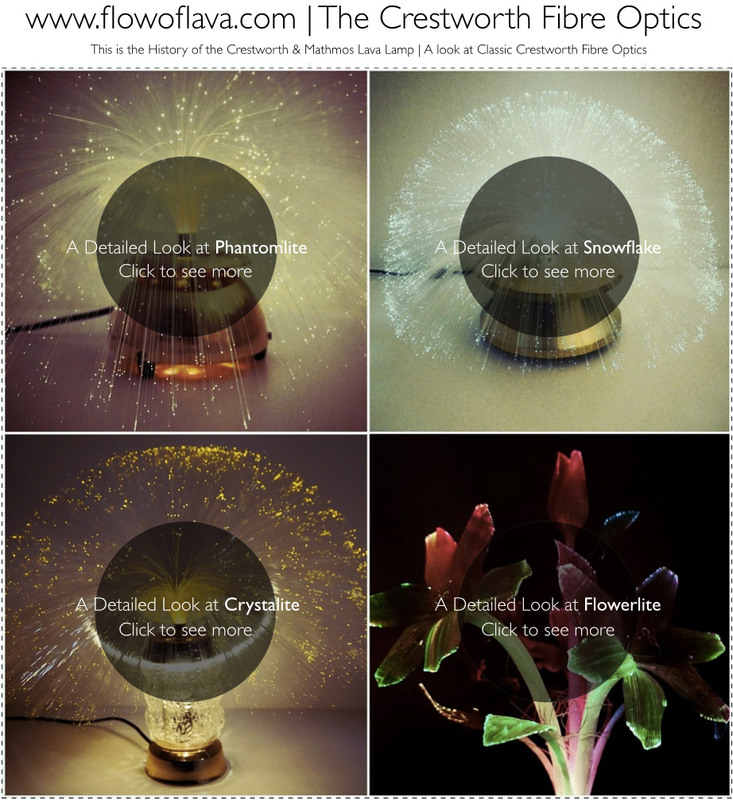 With special thanks to Callum & Nick Carr for their wonderful images of the Crestworth Crystalite fibre optic lamp. 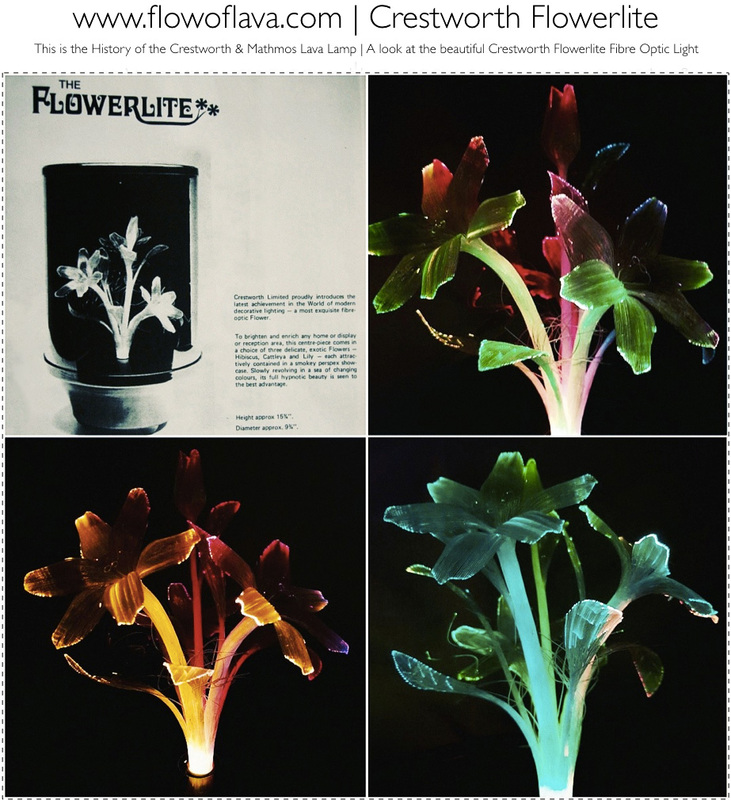 Crestworth Flowerlite | Illuminated fibre optic flowers gently and peacefully rotating inside a perspex smokey enclosure. 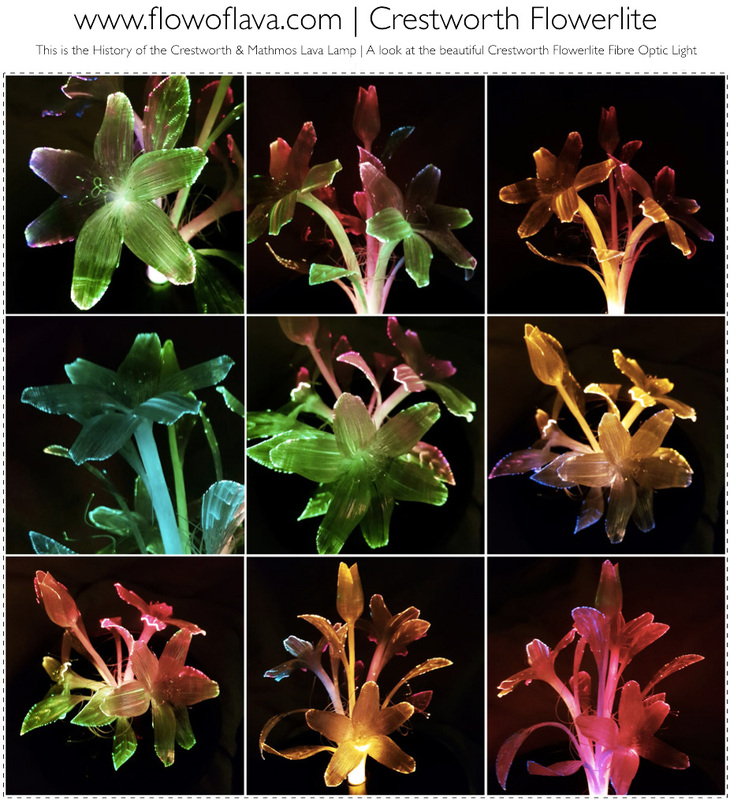 The Flowerlite is a stunning Crestworth lamp that was manufactured from the same dark smokey perspex as the the Crestworth Galaxy, however features plastic fibre-optic flowers which rotate in a circular fashion. The flowers change colour as they rotate within the dark plastic casing. A real vintage piece and very few have been seen, unlike the Galaxy it has a cylindrical form. The height is appox 15 inches and the diameter is about 9 inches approx. With special thanks to Jeb Paterson for the images below. 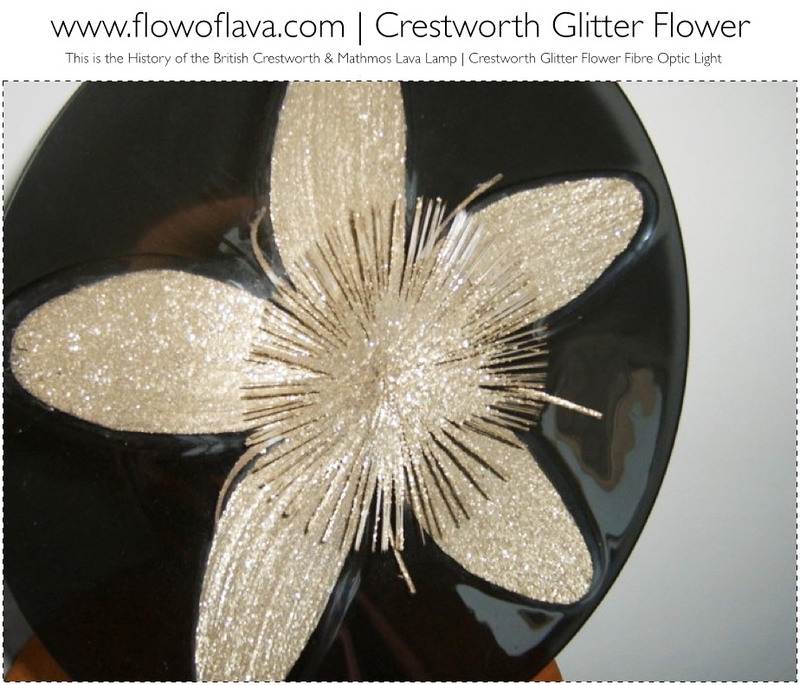 Crestworth Glitter Flower Fibre Optic Design. 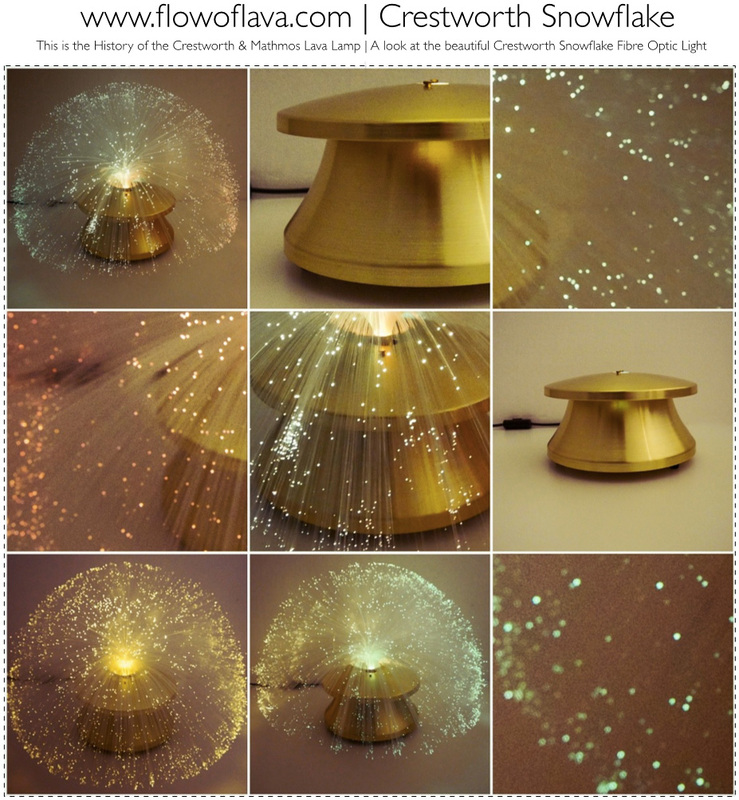 The images below display a wonderful design by Crestworth for a fibre optic lamp that is like no other lamp ever seen before, mixing the greatness of the Crestworth Phantom Lite, the Nordic base and glitter, this is a stunning piece. Instead of having fibres that simply spread out in a traditional spray fashion, this piece features a fan design with the optics arranged like a flower in bloom. The fibre optics are coated with glitter. This model is very fragile but very stunning. A few of these pieces have been seen and they are very elusive to find. This model has also been seen with a silver and copper finish. They do not feature in any Crestworth catalogs at all and have never been referenced before. Please see the images below, courtesy of Paul Meade. For more information on theis model, please click the image below to enter a special page dedicated to this wonderful Crestworth piece. 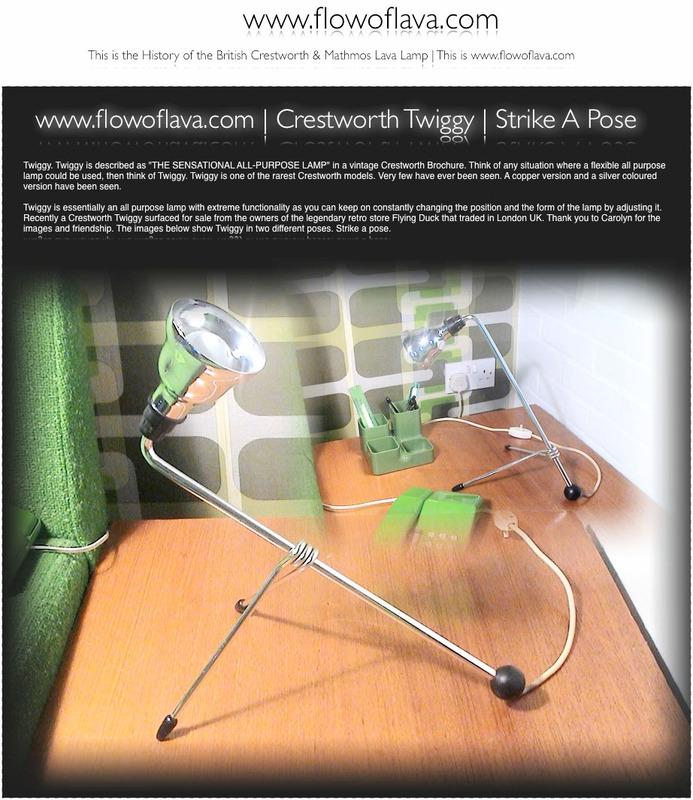 Crestworth Twiggy | A lamp for every place and every situation. 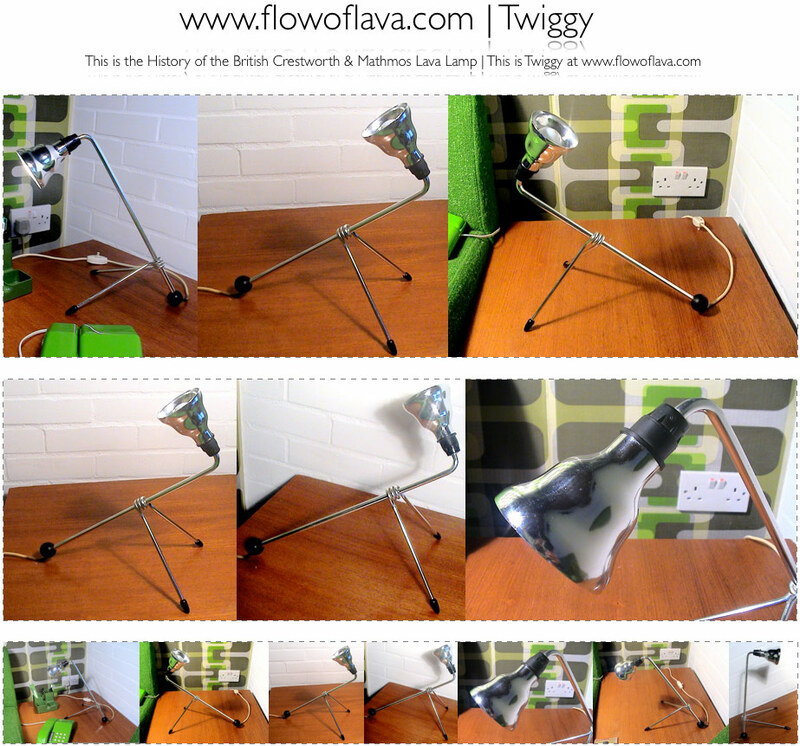 Twiggy is described as "THE SENSATIONAL ALL-PURPOSE LAMP" in a 1970s Crestworth Brochure. Think of any situation where a flexible all purpose lamp could be used, then think of Twiggy. Twiggy is one of the rarest Crestworth models. Very few have ever been seen. A copper version and a silver coloured version have been seen. 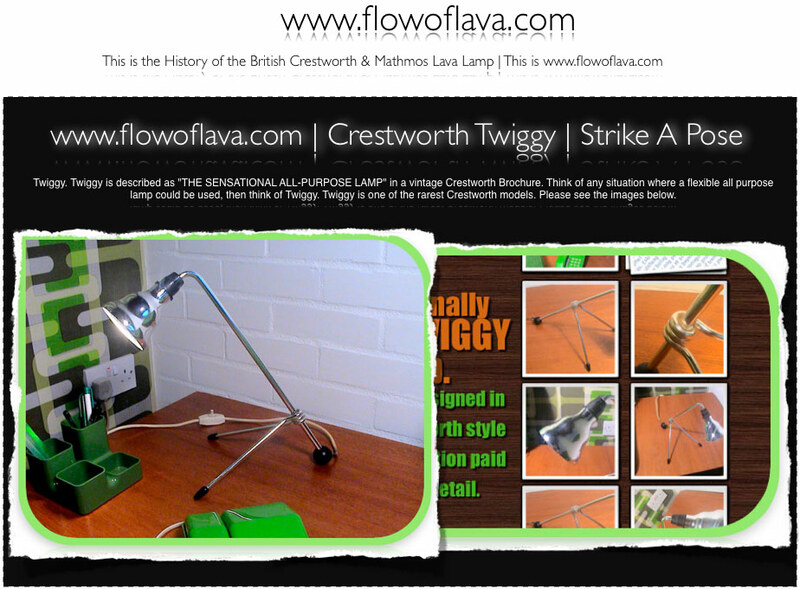 Crestworth Twiggy | A lamp for every place. Crestworth's Twiggy Lamp is essentially an all purpose lamp with extreme functionality as you can keep on constantly changing the position and the form of the lamp by adjusting it. Recently a Crestworth Twiggy surfaced for sale from the owners of the legendary retro store Flying Duck that traded in London UK. 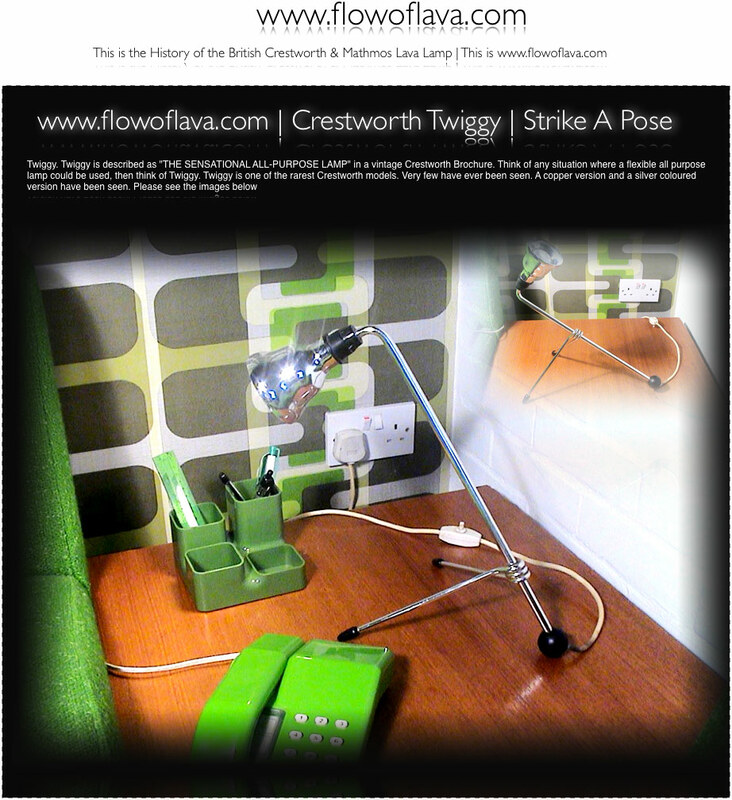 This page is dedicated to the the Crestworth Twiggy and also to the kind people at Flying Duck. The Flying Duck retro store was one of the greatest shops in London for retro items. It was really awesome and was so different to anything else in London. Interestingly, the Twiggy lamp did not even sell in their closing down sale, yet this little gem was brought to the limelight when it was placed online for sale. This just goes to show that even the rarest pieces of Crestworth history are out there somewhere. 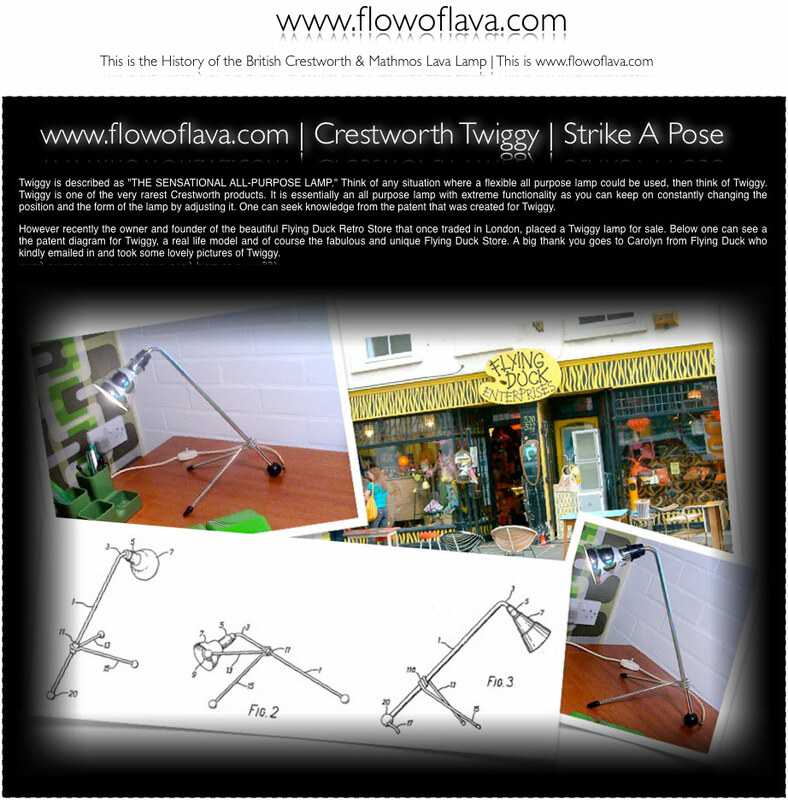 Crestworth Twiggy is one of the most hardest pieces of Crestworth history to find. Thank you to Carolyn for the images and friendship. 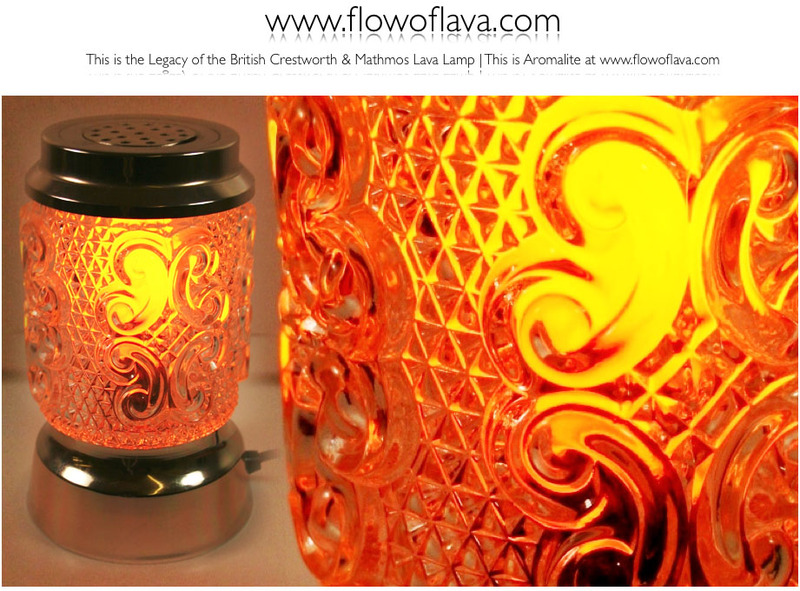 Crestworth Aromalite | Aroma Lamp | A lamp that activates your senses. 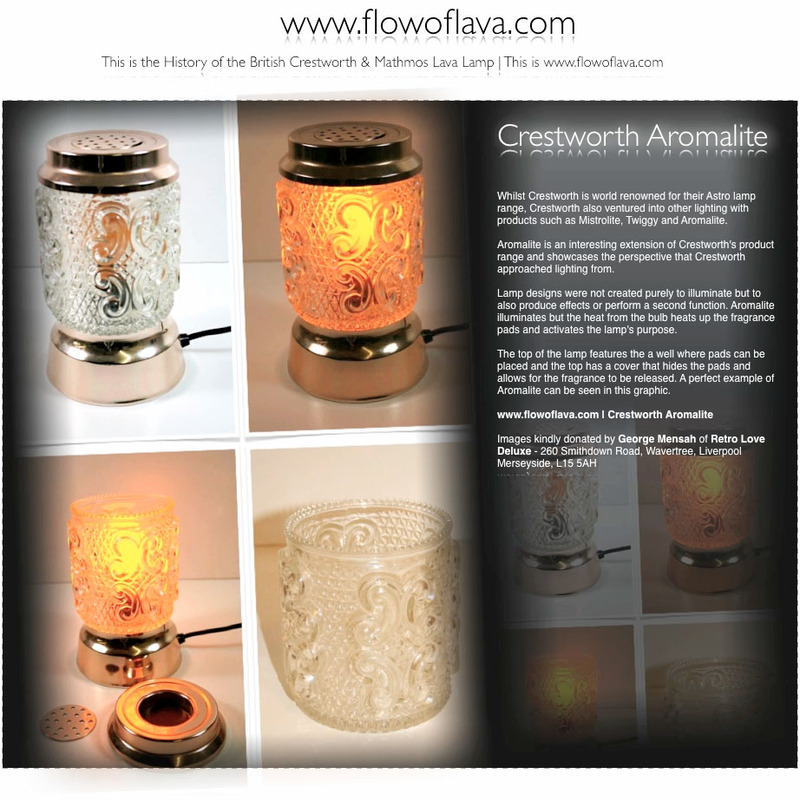 The Crestworth Aromalite, is a product that shows Crestworth's magic as a home lighting leader in the vintage years. Aromalite was Crestworth's Aroma lamp that featured ornate glasswork, excellent craftwork to produce the stunning metal parts. 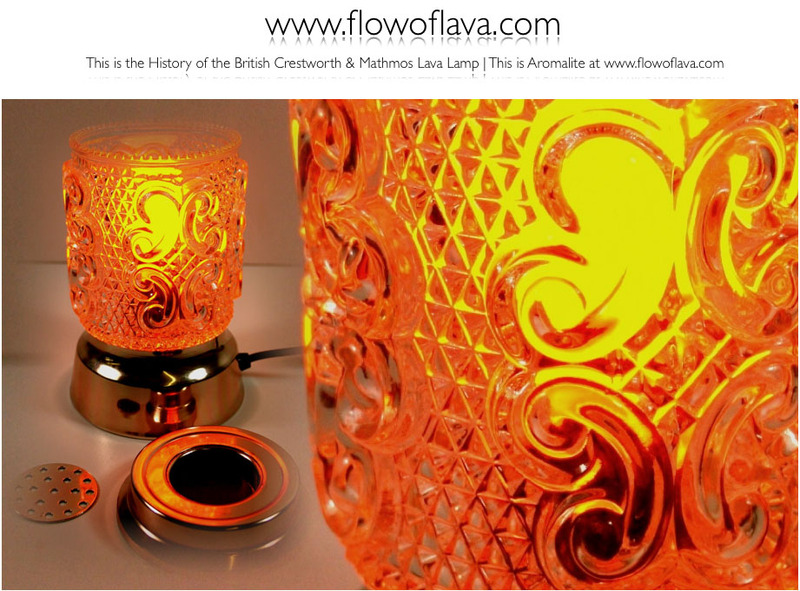 When the lamp was switched on, it would glow through the ornate glasswork but the top part of the lamp had a well where circular fragrance pads could be placed. As the lamp was switched on, the heat from the bulb would activate the fragrance. The pads are no longer in production, however one can simply use oils at the top or on a cotton pad. 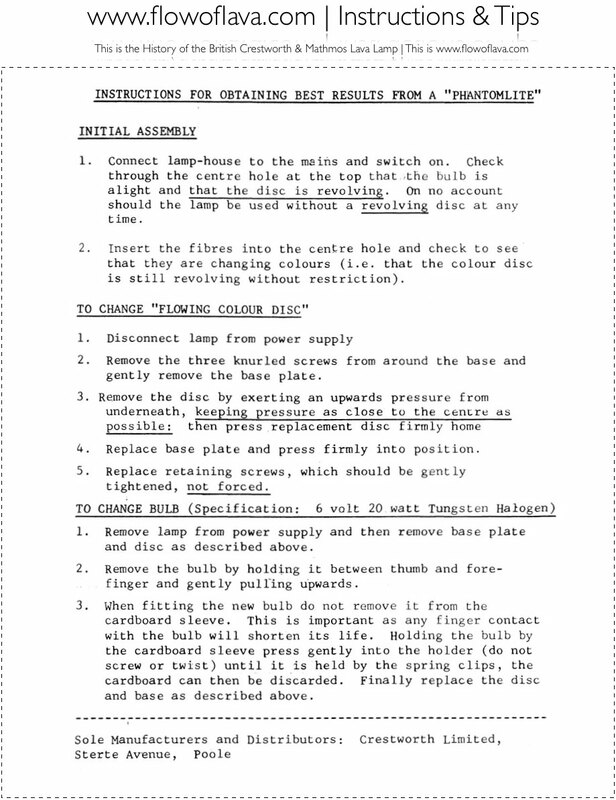 Crestworth recommended the use of a coloured bulb in say amber - operating at 25 to 40 watts. Obviously the greater the wattage, the concentrated the resulting aroma will be. The Aromalite shipped in a small card box with an image placed on the front of the box. It also included eight cellophane envelopes each containing an absorbant pad impregnated with a fragrance. 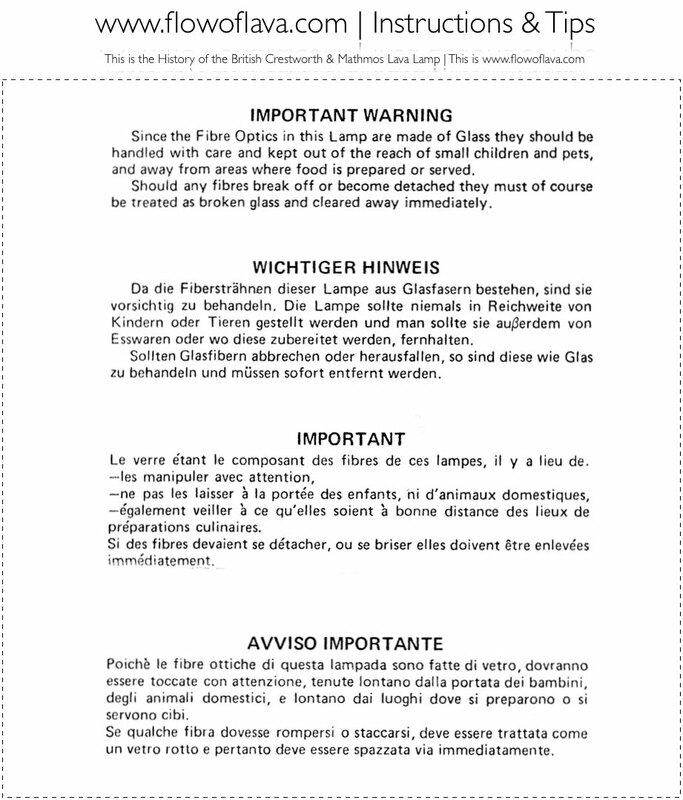 When the fragrance was choosen, the special page should be placed into the well at the top of the lamp. Each pad should be kept for each fragrance and each should be washed out and dried before trying another fragrance. The original fragrances for the lamps were: Hawaiian Breeze, Persian Garden, Canton Spice, English Rose, Norwegian Forest, Caribbean Sunrise, Alpine Meadow, Sahara Oasis. Each were priced at £1.80 each. Spare dispersant pads were priced at 50p each. Spare Lamp Glass was sold at £2.50. One could purchase 3 bottles of Fragrances for £5.00. The amazing photos below show the glasswork, the component parts, the lamp on and the lamp when it is switched off. 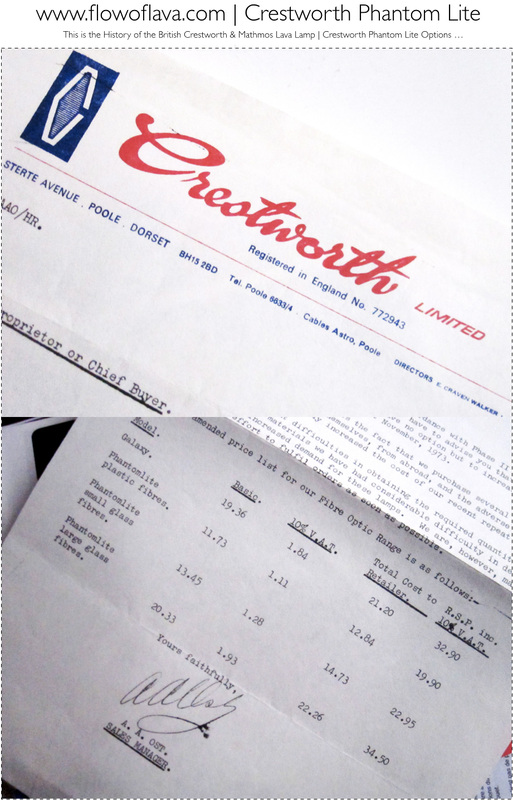 This is a genuine wonderful piece of Crestworth's history that is hard to find. 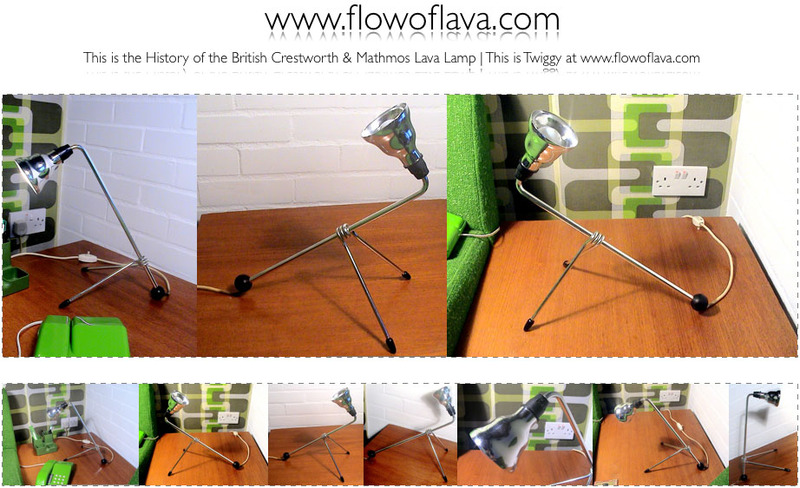 These wonderful photos of an excellent example of this lamp in pristine condition were kindly taken by: George Mensah of Retro Love Deluxe Ltd.
Retro Love Deluxe is an amazing shop dealing with mid century modern, vintage retro goodness, perfect for surrounding Crestworth creations. A beautiful shop online and check them out at 260 Smithdown Road, Wavertree, Liverpool Merseyside L15 5AH. 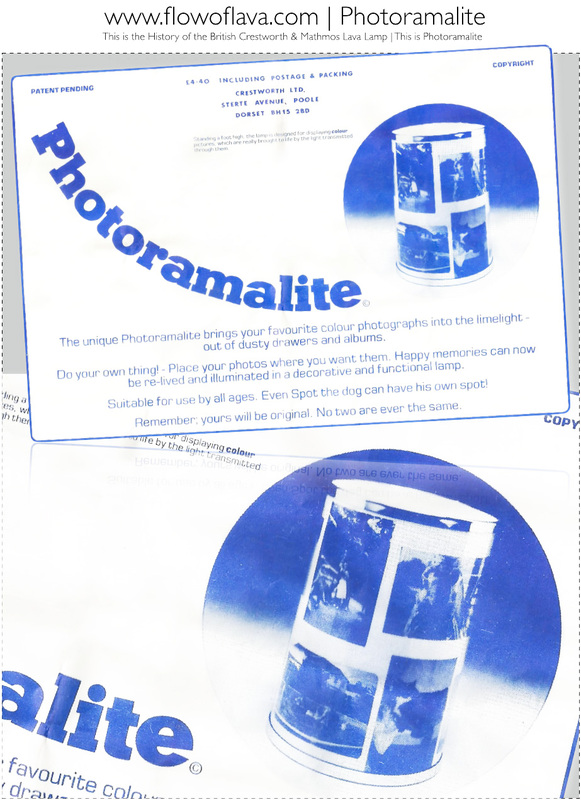 The unique and fun named Photoramalite allowed people to display their favourite colour photos in a new light, using the end-user's photographs, each and every Photoramalite would be unique and would make a fun and thoughtful gift. £4.40 Including Postage and Packaging from Crestworth Ltd. Sterte Avenue. Poole. Dorset BH15 2BD. Image kind courtesy of Andy Ross.